ImageSalsa - The Only WebCam Software You'll Ever Need! So, I weighed my options and decided the best thing is to give the software away on an "as-is" basis. If you have purchased either program in the last year, I will gladly support you through the support page for a full year from your purchase date. For folks downloading it and using it for free, there are various forums out there with users who may be able to support you, but I won't be able to provide personal support. We came up with the name ImageSalsa because we thought putting "cam" in the name would associate it with the dozens of webcam software programs already in existence. When you try out ImageSalsa, you will quickly realize that the camera is just a small part of the creation. You start off with a blank rectangle. You then layer camera images, pictures from your computer, images off the web, lines, rectangles, and lines of text just like adding colors to a painting. You can drop shadows, change each element's transparency, apply color filters (for example, apply the sepia filter to make any image look like a turn-of-the-century photograph), rotate by any angle, and more. When you combine so many elements in one container -- each recognizable and important to the final results -- we thought of salsa. So why not ImageSalsa? Well, because ImageLoaf and ImageStew just didn't have the same effect. So, what else can it do? You can save a series of images to be used by MovieSalsa to make time-lapse movies, detect motion and save the images to disk, write programs in VBScript to automatically customize images, and more! You can even use the images you create as your desktop background and have ImageSalsa refresh them periodically. Get your images on the World Wide Web! ImageSalsa can regularly FTP images to a web server. If you don't have a web server or you would like to host images directly from your PC in real-time, use ImageSalsa's built-in web server. If you are an Virtual Weather Station or Weather Display user and own a personal weather station, you'll find that the Weather Edition can even import all your text, graphics and weather data direct from Virtual Weather Station or Weather Display. For example, you can place the current temperature right on the image. When the temperature changes, so does the image. Virtual Weather Station and a wide range of compatible weather equipment are available from Ambient, LLC. 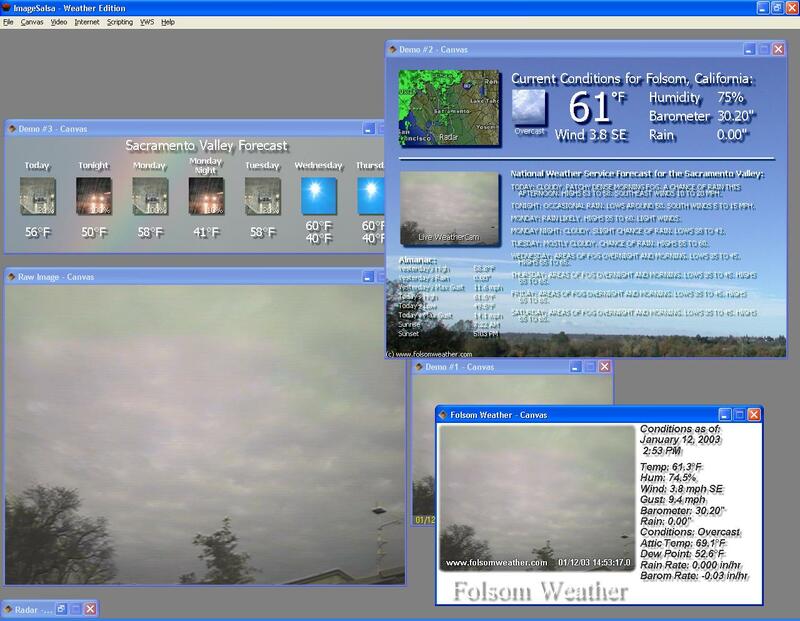 Weather Display is developed by Brian Hamilton and is available here. Why use ImageSalsa over other software solutions? Flexibility: We designed ImageSalsa from the ground up to be flexible. We understand that most web publishers have some creative talent. Why limit your image to a single line of text with the time and maybe one logo? You can add multiple images to a background, layer dozens of lines of text, up to twenty pictures. Plus, you can even have your "canvas" change on the fly by writing a script to control every aspect. Scripting: As far as we are aware, ImageSalsa is the only webcam software on the market with scriptable automation. Imagine changing a line of text based on the time of day. Place a "joke of the day" on your image. Change the logo or other icons based on some external factor like weather conditions, drive space. Place your business' hours of operation for today on the image. Industrial applications can place important environmental data or process information directly on the image. Tell your family members "Happy Birthday" when those days arrive. These are just a few ideas -- only your imagination can limit how much you can go. Stability: Running a site 24/7? No worries. ImageSalsa was designed and tested to run weeks on end without even a hiccup**. Supports Multiple Cameras: Other products charge twice their regular price or more for just this feature. ImageSalsa includes this capability in all versions+. Supports "Network" Cameras: By setting an inserted graphic's source to a network camera's web address, you can place one or more network cameras on an image. Support for DV Cameras: In version 2.0, we added support for DirectShow drivers, including the ability to import DV directly from a DV-equiped video camera. Price: FREE as of 10/13/2014!!! See other demonstrations from customers on our links page. To learn more about our MovieSalsa, our time-lapse movie making product, follow this link to the MovieSalsa product page. **Overall system stability also requires stable drivers and a stable OS. We recommend Windows 2000 or Windows XP for the best stability. We also recommend using a well-recognized camera or video capture card with known stable drivers. + Cameras need to appear as separate Video-for-Windows devices. Also, the manufacturer's drivers need to support multiple devices -- many get confused, to put it nicely, when you plug into two capture cards or two USB cameras of the same type. See the Testing Zone for tested information. If you are unsure if your two cameras will work, try them out on the Demo version first. You can also use more than one network camera.